If you're a cookie fan and you love sweet-salty flavors, then this is the perfect recipe for you. Simply choose the cocktail peanuts option and leave out the chocolate chips and you'll be in sweet-salty heaven! For those chocoholics among us, don't miss the option below for chocolate peanut butter oatmeal rounds. Before we get to the cookie recipe, here's a few facts about peanut butter you may not be aware of. By law, peanut butter has to contain 90% peanuts and no artificial flavors, colors or preservatives are allowed. Peanut butter usually contains stabilizers to keep the oil from separating. Natural peanut butter, made from only peanuts and oil, must be stored in the refrigerator and stirred before use. Either type will make delicious cookies. In a large bowl with an electric mixer on medium-high speed, beat the butter and peanut butter for 30 seconds. Add granulated sugar, brown sugar, baking powder and baking soda and beat until combined, scraping down sides of bowl occasionally. Beat in as much of the flour as you can with the mixer. Stir in any remaining flour. Stir in oats and peanuts, or chocolate chips. Drop cookie dough by rounded teaspoons about 2 inches apart onto ungreased cookie sheet. Bake about 10 minutes or until the edges are light brown. Transfer cookies to a wire rack and cool completely. Prepare as above, except melt and cool 3 ounces unsweetened chocolate. After beating in the eggs and vanilla, stir in the chocolate. 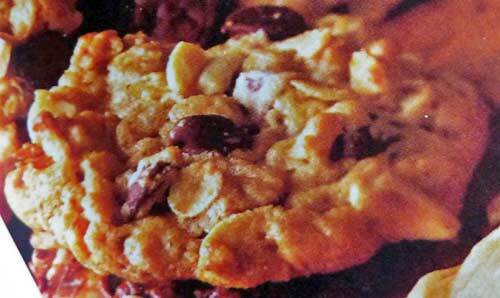 Looking for an easy recipe for Peanut Butter Chocolate Chip Cookies that begins with a cake mix? If counter space is tight, you'll love these Stackable Cooling Racks - perfect for cookies, bars, brownies and any other baking you might be doing. Store your cookies on the counter in this simple, attractive glass cookie jar, for all to enjoy. "I have been researching and trying a number of recipes to make a healthy cookie similar to one that our Gym coffee shop sells for $3.50! This particular recipe was adapted so instead of bars I made thick round cookies and cooked them just underdone so they were soft and chewy. They were a hit with all the girls. Thanks for the great recipe."